"The Longobards in Italy, Places of Power, 568 - 774 A.D." comprises seven groups of monuments built by the Longobard / Lombard elite. They are considered a unique and exceptional testimony to the transition between antiquity and the European Middle Ages. I visited the two inscribed sites in the former Longobard Duchy of Spoleto: the Clitunno Tempietto and the Basilica San Salvatore in Spoleto. They both were almost impossible to find. I relied on my car navigation to get me there, thinking that the sites would be posted from the main road also. But I had to search for quite a while: these are really minor sites, far off the beaten track. I started at Clitunno, a small town in the mountains north of Spoleto. Some kind of market was going on, and both sides of the main street were littered with parked cars. The Tempietto is situated outside the center, actually along the main road but not visible from there. A tiny sign points to its location. Normally you can get there by car, but the road was blocked now due to the festivities. So I just walked there, and had to ask once again for directions (as one sign really isn't enough). It turned out to be a cute little temple. Looked pre-Romanesque to my untrained eye, a bit similar to the Asturian monuments. The iron gates around it were closed unfortunately: opening hours seem to be only in the afternoons. So I just took some pictures from behind the fence. Then I went back to Spoleto, about 20 minutes away. Spoleto is a touristy city, with lots of history and an enormous castle as the main point of attraction. The San Salvatore Basilica isn't in the city center however, it lies on the other side of the main road. It took a while for me to find it, signs are only visible when you're almost there. The church looked deserted when I arrived, and I was afraid that it would be closed too. But the main door was open, although no one was around. The main focus of the church interior is the re-use of Ancient Roman pillars in the church choir. They look well-preserved. The rest of the church is simple early Romanesque. It does have a certain charm however. Next to it is a huge modern cemetery. P.S. : in December 2013, I visited two of the other locations. Castelseprio-Torba is spread out over a lovely hill location. Unfortunately the main highlights (church, antiquarium) were closed, but I could walk around the archeological site. Better luck I had with Brescia: there the zone with the Roman remains and what is now the Sta. Giulia museum is included. The museum is excellent, it covers so much (Roman, Longobard, Renaissance) - I had 1.5 hours to see it before it closed, and was warned already at the start to manage my time well. 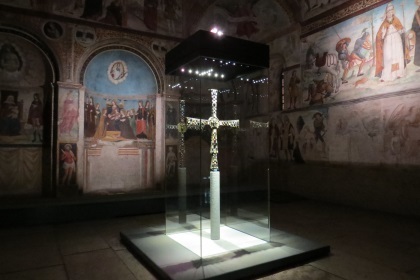 Sometimes it's like walking in a "normal" museum, but just around the corner some surprise awaits such as the brilliant Renaissance nunnery choir, the fresco-highlight of San Salvatore or the church room with the Cross of Desiderius. Well worth the 10 EUR entrance fee. I visited the site at Cividale del Friuli today and must say I was a little disappointed. Maybe if I had visited additional sites included in this listing, I would have gained a deeper understanding into the inclusion of this town by UNESCO. The included area in the town is small, comprising only the cathedral and the area immediately surrounding it. The cathedral is nice, but nothing particularly special compared to others in northern Italy. The main highlight is the Longobard Temple in the Monastery set behind the cathedral. This is lovely but very small, and has a real sense of feeling special. The problem being that for me at least, I failed to grasp the reason for it being so special. The site didn't seem to have any detail on how this place fit into the wider listing. Nevertheless the town itself is lovely, a series of winding, narrow and cobbled streets with a picturesque bridge over the river offering great views of the town and cathedral. I enjoyed my visit, but wished for more context. I will try to visit other sites in the listing in the future in the hope of broadening my understanding. Note that the monastery, and thus the temple, is closed over lunchtime (12-2pm in winter, 12-3pm in summer). The entrance fee was EUR 4 per adult. The transition from Antiquity to Medieval times can be well traced with world heritage sites. You start in Split where you get a last peek of Roman culture in Diocletian's Palace. Ravenna comes next and you already start noticing that a major culture shift has taken place. Everything is a lot smaller all the while less worldly and more religious. With the Longobards you complete the transition to the Medieval Age with small and mostly simple churches remaining. As a short stop over on my way from Assisi to Rome I visited the Basilica San Salvatore in Spoleto. I was really lucky as the chapel is currently (April 2018) closed due to renovations. However for Easter they opened the door so you could take a look. There wasn't all that much to see, though, as it's a fairly plain chapel with simple painted decorations. A few years before I had been to Santa Giulia museum in Brescia, originally built as a monastery by the Longobards. In comparison I found the site more interesting and accessible. 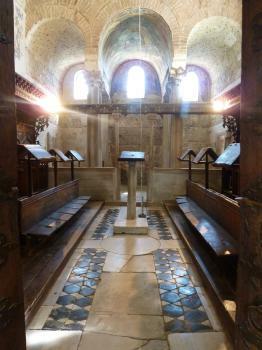 A highlight is the oratory that was added in later centuries. Also, my understanding is that the nearby Roman ruins are also included in the inscribed site. Brescia is conviently located on the major North Italian railwail line running from Torino to Venezia offering easy access to all sites of the Milan and the Veneto hotspots. It's also from here that you can catch the train to Valcamonica. Spoleto can be reached from Rome on a day trip. 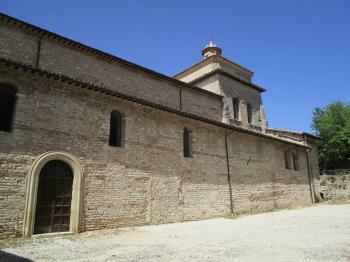 It can even be combined with a visit to Assisi on the same day if you manage your time well. From Spoleto there is also a train to Ancona given you access to the sites there (Urbino, San Marino). Both Brescia and Spoleto host nice old towns and are well worth a visit. After visiting San Salvatore-Santa Giulia in Bresia in 2012, I never paid any more attention to Longobards in Italy. In July 2017 I went to Spoleto to see two productions at the Spoleto Festival, perhaps the most important annual performing arts festival in Italy, and stayed there overnight. I was pretty impressed with the town of Spoleto itself, complete with a Roman amphitheater, a cathedral, a fortress and even an aqueduct behind the fortress that "almost" looks like Pont du Gard. Walking from the lower tier to the upper tier of the old town, I was suddenly jolted by a sign that says "Spoleto the World Heritage City." "What??? How low can they (tourist office) go to call their city a World Heritage City when it's not?" was my first reaction, but the rest is history. As it turns out, the Basilica of San Salvatore is in the core zone and the entire old town is in the buffer zone of this site, one of the 7 components of Longobards in Italy. But the Basilica is outside the old town center. When I travel these days, I'm almost completely dependent on Google Map with the blue dot of my own location and with its search function. So locating the Basilica of San Salvatore was not a problem. But I noticed that while I saw many signs in the old town touting the Basilica as a WHS, once I tried to get there, I did not see any signs whatsoever from the old town center all the way to the Basilica, where I found a some sort of notice and took a photo. Not a soul could be seen around the Basilica. The large cemetery also looked abandoned, sadly. And the Basilica was closed. OK, I just tried to read the notice at the basilica in my photo. Even though I know little Italian, I believe it says "it's temporarily closed due to the natural events." I see. Well, indeed, before I got to Spoleto, I was wondering if the town of Spoleto was even functioning after that devastating earthquake nearby in last October. Of the seven sites I have so far been to three: two in Umbria (visited April 2015), and one in Friuli-Venezia Guilia (July 2015). 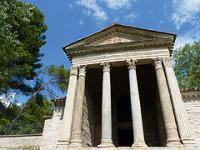 The Clitunno Tempietto wasn’t easy to find, but I had been prepared for that and we soon located it. For a while we were the only people there, which was nice. I love it when I go to a World Heritage Site and there is nobody else around. You can see the Roman-style architecture of this temple – it looks nothing like a church, yet it was built for Christian worship in the Dark Ages. Remnants from this period of history are not generally well-preserved; it is underrepresented on the UNESCO list, so you can really pick up something novel from visiting the Longobard sites. The basilica of San Salvatore is just a short drive away, in the Umbrian town of Spoleto. It is a much larger building, and totally empty inside. I liked the basilica’s Byzantine depiction of Christ the Teacher. The Gastaldaga area and the Episcopal complex in northeast Italy is in the charming town of Cividale del Friuli. We arrived there after seeing Škocjan Caves and Idrija mercury mine in Slovenia. The carved figures in the temple were inspired by the Porch of the Caryatids in the Erechtheion on Athens’ Acropolis. I visited this WHS in August 2013. Following Els' review, I did my research to have at least the name of the streets closest to the two sites near Spoleto. Still it was not easy to find them! 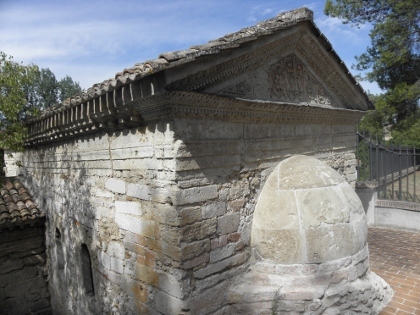 Tempietto del Clitunno is just beside the motorway in Campello sul Clitunno, around 12km from Spoleto. The rear side of the temple is visible from the motorway. It is only open in the afternoon on certain weekdays and costs 2 euros to visit. It is kept in very good condition and I was happy to pay the entrance fee knowing that I was directly funding it (since it is managed locally and not by the region). Then I visited the Basilica of San Salvatore just outside Spoleto near a new cemetery. Just park near the cemetery and walk 200 metres to the Basilica, otherwise it will take ages to get there by car since almost all roads are one way! The entrance to this desacrated church is free and both the exterior and interior are austere. You can see the different styles and columns coming from previous buildings on the same site. The several leaflets and information I was given from Spoleto's tourist information centre helped a great deal appreciate the details of this WHS and hopefully I'll be able to visit more sites in the near future. Brescia - St Salvatore/Santa Giulia monastery. 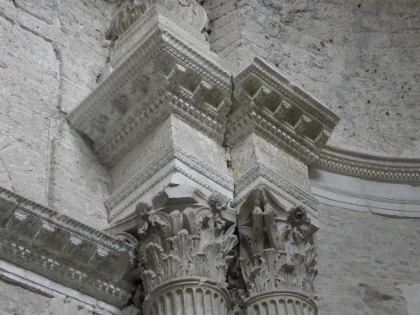 Monte Sant'Angelo - Sanctuary of St Michael, attracted numerous pilgrims. Reached by bus from Foggia and Manfredonia. 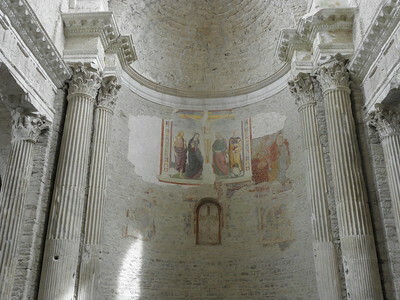 Spoleto - Basilica of San Salvatore. Reached by bus 'D' from thestation to the cemetery. The basilica adjoins the cemetery on the uphill side. Campello sul Clitunno - Longobard temple. A 3km walk from the station past the Clitunno spring. My first taste of this site, which is spread across Italy, was in the delightful town of Cividale del Friuli tucked up in the North East near the Slovene boarder. The town was a rather wonderful clump of cobbled streets, erratic squares and precipitous bridges cut through by the powder blue waters of the river Natisone. This was the first capital of the Longobards in Italy so seemed like a great place to start with this site. The actual inscribed bits of the town are limited to the cathedral and the area surrounding it. I must admit to not finding the cathedral particularly remarkable, however the real highlight was behind in the Lombard Temple. The temple is in a pleasant ecclesiastical complex, and is pretty tiny, however the delicate, almost brittle looking woodwork and frescos were exceptionally rewarding. The wonderful view from the jasmine scented terrace at the exit was great. After this I had a trip around the museum which had a fine selection of Roman (the town was founded by Julius Caesar), and Longobard exhibits, including the contents of graves from the nearby necropolis. I doubt I could design a more pleasant place to while away a sunny Sunday morning, a slow cappuccino overlooking the Duomo was the perfect way to slow down after a wonderful night out in nearby Udine, which is a lovely place to bar hop on a Saturday night. Hopefully in the future I will visit more of this serial inscription; if they are even half as pleasant as my first visit they will be well worth the effort. 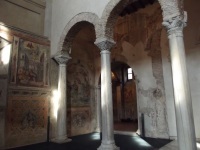 I have visited the San Salvatore-Santa Giulia museum complex and Brescia. Although the highlights of the complex are the Winged Victory and the richly decorated Santa Maria in Solario containing the crucifix of the Lombard king Desiderius, I think the museum's most significant contribution is the extent to which it documents the history of Brescia. From prehistory to today, the museum is packed with artifacts, both fascinating and mundane, tracing the development of the city through the ages. Outside of the museum, one can also explore remains of civilizations from the Romans and beyond through open-air excavations. This summer, I will also visit Cividale, Castelsprio, and Monte Sant'Angelo, so I will update when I get the chance. I suspect that this list will most likely be expanded in later years. Namely, Pavia would probably be added for being the Lombard capital and for a few surviving churches from the era. Also, Monza will probably be added as well for housing the Lombard crown. Being interested in medieval history and all things Italian, I was really looking forward to seeing this site inscribed. Sites from late Antiquity and the early Middle Ages are rather underrepresented on the list, and this seems to fill the gap at least a bit. 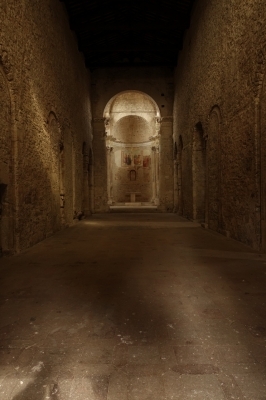 When I looked at the individual sites, I was slightly surprised to find a site that I had been to a few years ago - the Sanctuary of San Michele in Monte Sant'Angelo, in the southeastern region of Puglia. Dedicated to the Archangel Michel, this is one of Italy's most important shrines and pilgrimage sites. I knew about the connection of this place to the Normans, but I was unaware of any Longobard influence here. Well, there isn't such a big one really, it's just that one Longobard king (Rothari) was buried there. I'm not sure this is enough to include it in a Longobard-themed WHS, but I probably missed his burial chapel when I was there (reason enough to return one day...). The other sites seem to be worth a visit as well, although I'm surprised that Pavia, capital of the Longobards, is not included (it is a separate site still on Italy's T list). 3.5: Els Slots Klaus Freisinger Antonio J. The Longobards in Italy, Places of Power, 568 - 774 A.D.
Romanesque: a specific sub-style sometimes called "First Romanesque" or "Lombard Romanesque"
Horse Burials: The Longobards also had a practice to bury horses with their dead warriors. One example is on display at the Archaeological Museum of Cividale. Modelled after: Torre Angioina of the San Michele Sanctuary is modelled after the towers of Castel del Monte.